You all should really subscribe to the Crash Course YouTube channel. Some of their output is perhaps more suitable for A level students, but the scientific content is great. I really like the presentation too but it is quite American (I hope my readers in the US will understand….) so I am prepared for people to disagree…. Anyway here is the introduction video to Nervous Systems: great for my two Year 11 groups just now. Enjoy. But in this new post I am going to give you a tiny bit more detail about the types of nerve cells (neurones) that you might encounter, together with an explanation about the most important component of the nervous systems: the chemical synapse. Neurones are the cells in the nervous system that are adapted to send nerve impulses. You won’t fully understand what the nerve impulse is until year 13 but it is correct so that it is a temporary electrical event that can be transmitted over large distances within a cell with no loss of signal strength. The upshot of this is that neurones can be very long indeed…..
Relay (or sometimes Inter) neurones are found within the CNS and basically link sensory to motor neurones. These three types of neurone also have different structures although many features are shared…. This is a diagram of a generalised motor neurone: I know it is a motor neurone since the cell body is at one end of the cell. The cell body contains the nucleus, most of the cytoplasm and many organelles. Structures that carry a nerve impulse towards the cell body are called dendrites (if there are lots of them) and a dendron if there is only one. The axon is the long thin projection of the cell that takes the nerve impulse away from the cell body. The axon will finish with a collection of nerve endings or synapses. The diagram above shows a sensory neurone. You can tell this because it has receptors at one end collecting sensory information to take to the CNS. 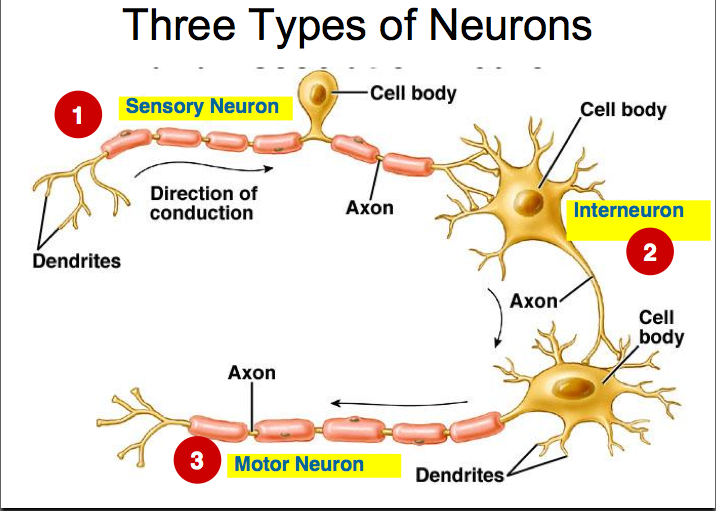 The position of the cell body is also different in sensory neurones: in all sensory neurones the cell body is off at right angles to the axon/dendron. You can see from the diagrams that motor and sensory neurones tend to be surrounded by a myelin sheath. Myelin is a type of lipid that acts as an insulator, speeding up the nerve impulse from around 0.5m/s in unmyelinated neurones to about 100 m/s in the fastest myelinated ones. The myelin sheath is made from a whole load of cells (glial cells) but there are gaps between glial cells called nodes of Ranvier. These will become important in Y12/13 when you study how the impulse manages to travel so fast in a myelinated neurone. Relay neurones, also known as interneurones, have a much simpler structure. They are only found in the CNS, almost always unmyelinated and have their cell body in the centre of the cell. The diagram above shows the three types of neurone and indeed how they are linked up in a simple reflex arc. The artist hasn’t really shown the interneurone structure very well, but it was the best I could find just now…..
Nerve cells are linked together (and indeed linked to muscle cells) by structures known as synapses. There are a lot of synapses in your nervous system. The human brain contains around 100 billion neurones and each neurone is linked by synapses to around 1000 other cells: a grand total of 100 trillion synapses. 100 000 000 000 000 is a big number. The big idea with synapses is that the two neurones do not actually touch. 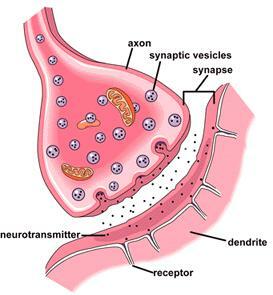 There is a tiny gap called the synaptic cleft between the cells. The nerve impulse does not cross this tiny gap as an electrical event but instead there are chemicals called neurotransmitters that diffuse across the synaptic cleft. The nerve impulse arrives at the axon terminal of the presynaptic neurone. Inside this swelling are thousands of tiny membrane packets called vesicles, each one packed with a million or so molecules of neurotransmitter. When the impulse arrives at the terminal, a few hundred of these vesicles are stimulated to move towards and then fuse with the cell membrane, releasing the neurotransmitter into the synaptic cleft. The neurotransmitter will diffuse rapidly across the gap and when it reaches the post-synaptic membrane, it binds to specific receptor molecules embedded in the post-synaptic membrane. 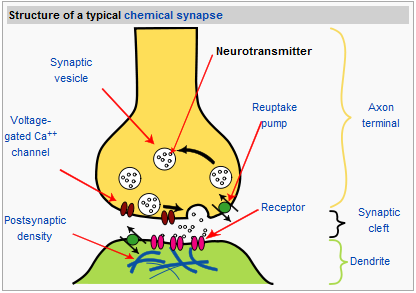 The binding of the neurotransmitter to the receptor often causes a new nerve impulse to form in the post-synaptic cell. These chemical synapses are really beautiful things. They ensure the nerve impulse can only cross the synapse in one direction (can you see why?) and also they are infinitely flexible. They can be strengthened and weakened, their effects can be added together and when this is all put together, complex behaviour can emerge. I am going to exhibit some complex behaviour now by choosing to take my dogs for a walk… And it all happened due to synapses in my brain!